Squirrels love walnuts. So to be a walnut tree, you either need to be fortunate enough to grow where there are no squirrels, or be strong enough to push out lots and lots and lots of walnuts, so the squirrels and jays and yes, people, can have their share. In fact, these virile trees push out so many little nuts that they factor in loss — to not strip some off in springtime stunts those that remain. That’s where we come in. There are several things you can do with unripe walnuts. My favorite is pickled walnuts. The French and Italians make a liqueur from unripe walnuts, too. And the English make a wonderful sauce from them called walnut ketchup. This unusual condiment seems to have originated in 1700s Britain, and the word ketchup is either from Chinese or Southeast Asian origin. Back then there were lots of ketchups, and only later did tomato win the tournament as the One True Ketchup. One of the old ketchups was this walnut ketchup. My recipe is an amalgam of one from 1808 and one from Gourmet magazine from 1948. 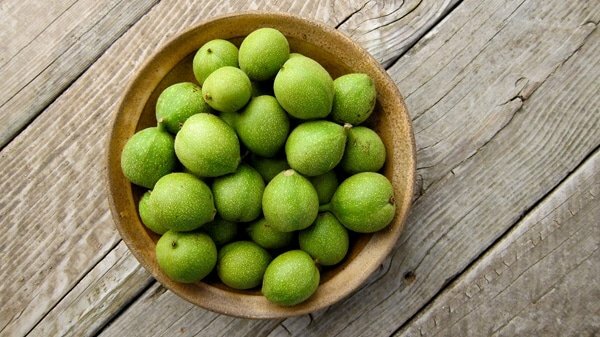 Basically you mash unripe walnuts, let them steep in vinegar for a week or more, then boil everything with wine, spicy things, anchovies and onion, strain and bottle. Anchovies? Yeah, sounds gnarly. But it isn’t. The sauce isn’t fishy at all, and the anchovies add a savory note to the sauce. What, then, does walnut ketchup taste like? 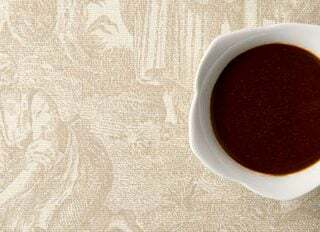 It’s very sharp, as you might guess from all that vinegar, but beyond the acidity, it tastes like a combination of Worcestershire and A1 Steak sauce. I am not kidding. It really is a dead ringer for A1, but is thin like Worcestershire. My advice: Go ahead and use some when you make it. But I can tell you that it really does mellow well after a year. I can’t speak for 20. I used unripe black walnuts for this recipe, but any unripe walnut will do. Ideally they are young enough to jam a knife all the way through, but you can even use slightly older nuts where the inner shell of the nut itself is starting to form. Keep in mind this is not as thick as tomato ketchup. It's more like a Worcestershire sauce, but it tastes more like A1. Use this as a marinade or splash it on any sort of red meat -- beef, venison, duck, goose, hare, etc. Crush, chop, crack or grind your walnuts. Remember this is a messy job and the liquid will stain, so your method should reflect that. I wear gloves and a ratty long-sleeved shirt and chop my walnuts small with a stainless steel knife on a dark-stained cutting board, This minimizes the staining. Put the walnuts in a large glass or other non-reactive container and cover with the two vinegars. 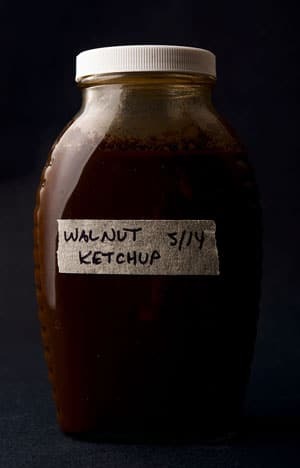 I find it makes a better walnut ketchup with only malt vinegar, but as this can get expensive, you can make do with some malt vinegar balanced with some cider vinegar. Just barely cover the walnuts with the vinegar. Put the lid on the container and let this sit at room temperature for 8 days. After 8 days, move the walnuts and vinegar into a large, non-reactive pot and add the remaining ingredients. Boil gently for 45 minutes, then strain through a fine-mesh sieve to separate the solids. As an extra step, you can wait until the sauce cools and then buzz the sauce in a blender with the xanthan gum; this will keep the very fine solids suspended in the ketchup and give you a sauce with more body. Bottle the sauce and keep it in a cool, dark place indefinitely. Really good after waiting 3 months to try it. It was fun to make, too. I tried your recipe. Do I need to refrigerate to store? Or can I set on the shelf for those 20 years? Thanks! Bob: It is shelf stable. Used some of the walnuts I brined for pickled walnuts. Like you I combined some recipes and used available spices. Which from the found recipes variety it looks like whatever you have in the pantry. It definitely needed some time on the shelf. After 5 months mine is more like worchestershire than A1. The pickled walnuts after 5 months are like solid chunks of strong worchestershire in a good way if used judiciously. Will be making both of them again modifying the recipe in the years that my low limbed walnut tree bears nuts. Not planning on using the extension ladder for it since I think one year’s batch will yield several years worth. Though my friends at a sportsmen’s club will take any overflow.